The National Center for Health Statistics (NCHS), a federal agency within the Centers for Disease Control and Prevention (CDC) that oversees the ICD-10-CM, has released the 2019 updates to the ICD-10 codes. A total of 473 changes have taken place. There are 279 new codes, 143 revised codes, and 51 deactivated codes. You can view all of the code changes here. 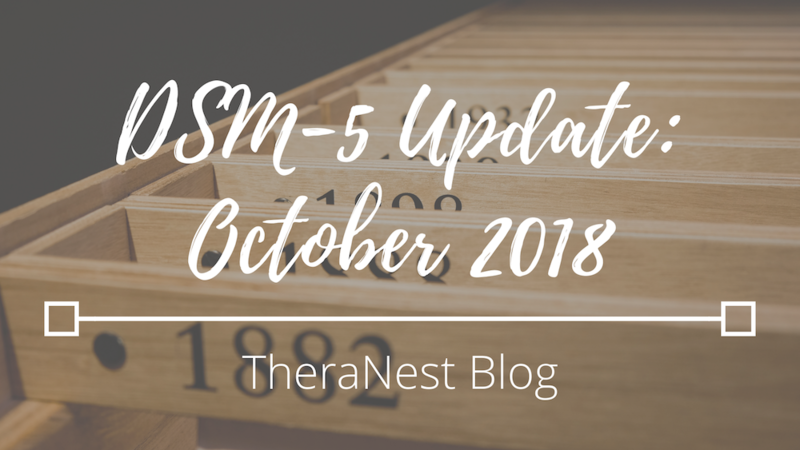 These DSM-5 updates are active starting October 1, 2018. These means all sessions with dates of services on or after October 1, 2018, will need to use the following updated codes. To learn more about these DSM-5 coding changes, check out this press release from the APA. TheraNest is ready for this update—starting October 1, 2018, these new codes will be available and ready to use in your TheraNest account. Don’t use TheraNest? Start a free 21-day trial to see how we can help you build a better, more streamlined practice!